At the same time, in the other hemisphere, Swedish technology companies, including Ericsson, Scania, Epiroc and SKF, are joining together in the Swedish Mining Automation Group (SMAG) and are beginning to promote their own products and technologies for mining companies. Sweden is currently not among the top mining countries, and therefore SMAG started its cooperation with Canadian companies that hope in the short term to upgrade their own production and to start using the innovative technology with the help of the concern. In Morocco, a Terex mining truck with robotic control developed by VIST Robotics has passed successful trials at a special test site at the operations of phosphate miner OCP. In Russia, autonomous BELAZ trucks are already being used by Siberian coal and energy company SUEK in Khakassia. 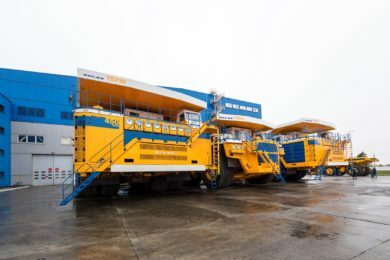 At the moment, the first robot dump truck has been assembled and successfully passed along the route of the mine haulage in an offline mode, while the process of assembling and equipping a second dump truck, as well as building the infrastructure necessary for the operation of autonomous machines is being carried out. In Kazakhstan, VIST Robotics together with the Nazarbayev University started to work on the truck tractor based on the KAMAZ NEO truck. In addition to unmanned trucks, the company is testing a robotic drilling system. It is planned that the developed product will replace a person in particularly dangerous production conditions, while the cost of drilling wells will remain at the same level or even decrease. The company expects to see the first test results in the second quarter of 2019. Australian mining giant BHP Billiton, known for its active introduction of drones into production, announced the beginning of using drones in sea freight in the experimental mode. The company intends to use drones to check the status of the holds of vessels before flights. Unmanned vehicles will replace the person and will independently record meter readings, look for the damage that cannot be seen with the naked eye and transmit the image in the 4K format to the operator. The expansion of the use of robotic and automated technologies in the mining industry is made possible by reducing the cost of innovative products. According to a McKinsey report, over the past 30 years, the average price of a robot has fallen by half in real terms, and even more in relation to labour costs. Analysts believe that demand from emerging economies encourages robot manufacturers to switch to cheaper regions, and robotics will continue to fall in price. Mines, which will use only robots, which will be controlled by robots, are no longer a fantasy. In 2019, one of the first of such projects may be implemented.